A scaffolder who punched a woman to the floor, leaving her paralysed, in a pub row over a spilt drink has been jailed for more than three-and-a-half years. 28 year old Claire Hilton, sat in her wheelchair and cheered as Christopher Towers was sentenced at Newcastle Crown Court. She suffered a broken neck and back when she was punched during a night out at the Wheatsheaf pub in Boldon in South Tyneside last June. 24 year old Towers, admitted grievous bodily harm at a previous hearing. He also admitted assaulting a bystander who was trying to help his victim. Recorder John Aitken sentenced him to three years for grievous bodily harm and an extra 30 weeks for assault occasioning actual bodily harm on the bystander. Towers' mother, 46 year old Lynn Flaherty, of New Road in Boldon, and his partner 30 year old Kelly McKone, of Stanhope Road in South Shields, both admitted one charge of assault relating to the same evening. McKone assaulted Ms Hilton and Flaherty attacked another woman. McKone was ordered to carry out 40 hours unpaid work and Flaherty was sentenced to a 12-month supervision order. Ms Hilton was floored around 150 yards from the Wheatsheaf following a row inside over a spilt £2.80 pint of cider. The ex-telesales worker spent a month in intensive care then treatment in a specialist spinal unit. Since then she has been unable to live with her 11 year old son Callum. 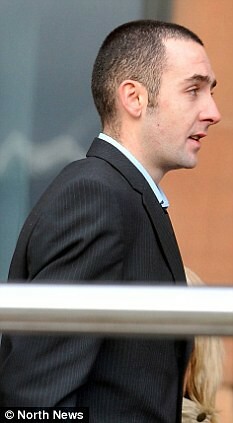 "He ran over and punched Claire Hilton and she felt full in the face to the left side of her head. This knocked her over, she hit a wall behind her before falling to the ground. Almost immediately she came round and realised she was paralysed. The court heard how the impact of the punch then the wall meant her head was "whipped forwards and back'' causing the top of her spine to be compressed. Ms Hilton was taken to South Tyneside District Hospital's A&E department before being transferred to a specialist spinal unit in Middlesbrough. She was given a tracheotomy to aid her breathing and put on a ventilator and underwent extensive surgery on her back. A medical assessment carried out last week found that six months after the attack, she has regained some mobility. Ms Hilton still uses a wheelchair for travel outside, she needs help to get in the bath and to put on socks and shoes. She still suffers pain in her legs and any movement on her own was assessed as "precarious''. The row started in the Wheatsheaf around closing time when Towers' mother Lynn Flaherty, celebrating her 46th birthday, had a drink accidentally spilled on her white dress. Flaherty swore and angrily demanded an apology and staff in the bar asked her group and Ms Hilton's to leave. As they walked along, Flaherty's group were abusive and she grabbed the hair and slapped a friend of Ms Hilton. Towers' then girlfriend Kelly McKone joined in, slapping Ms Hilton. It was at that point Towers stepped in and launched his devastating blow.